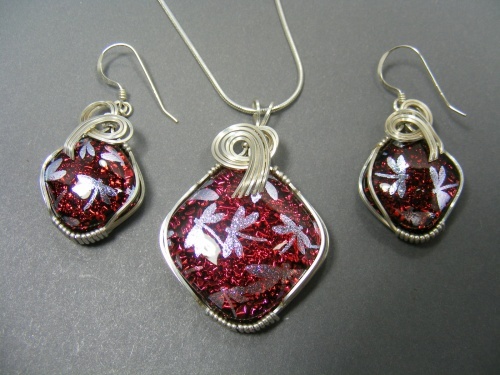 This gorgeous set of handmade dichroic glass has sweet little dragonflies fluttering over the deep vivid red background. Matching earrings and the pendant are sculpted with sterling silver swirls and curls to make this a set that enchant wearers. Pendant measures 1 3/4" by 1" and comes with a sterling silver chain. Earwires are in sterling silver and earrings have approximately an inch and a quarter.